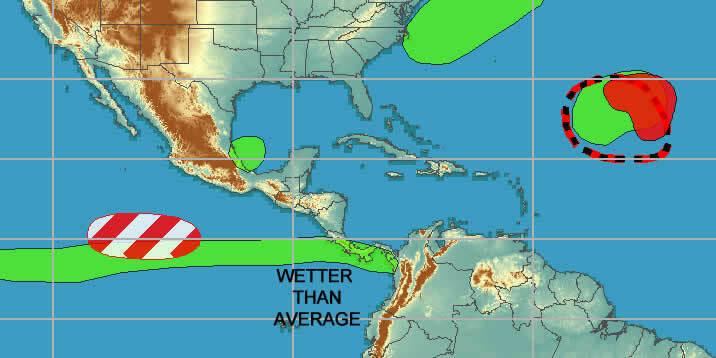 The U.S. National Oceanic and Atmospheric Administration (NOAA) weather service predicts with “high confidence” that 2019 daily rainfall across most of Costa Rica will be normal compared to historical averages for January and February. No variation from normal is predicted for early 2019. 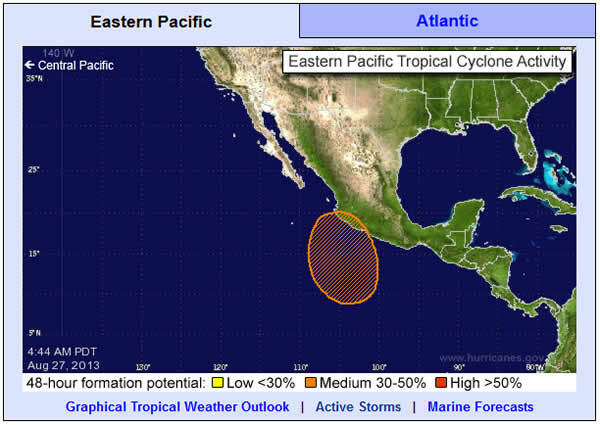 Should be sunny, hot and dry on the Pacific side and tropical on the Caribbean as dry season kicks off. Despite a mild El Niño (sometimes causes drought on Costa Rica’s Pacific side) there no variations from normal dry season weather predicted. 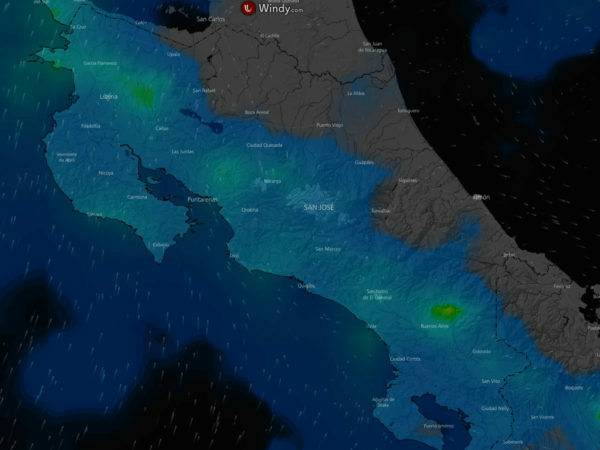 NOAA predicted two different patterns of variation from the normal rainfall in Costa Rica for late November and into mid December 2018. Most of the country is expected to be drier than normal (yellow) but the far south Pacific will be wetter (green band). It’s still the rainy season so expect daily tropical rains across Costa Rica with increasing winds beginning to blow out the clouds. Don’t make the mistake of assuming that “drier” is the same as dry. December is still a rainy season month and although there will probably be less rain than average but that can still be pretty wet. NOAA predicted (correctly) with a moderate degree of confidence it would be drier in the region (yellow stripes) compared to average rainfall for November 2018. NOAA (correctly) predicted with a high degree of confidence that the end of October would be wetter than normal in Costa Rica (the green zone). Tuesday October 23, 2018 – one small low pressure system far out in the Atlantic with only a 20% chance of organizing into a storm… Should stay relatively sunny (for the middle of rainy season) through the remainder of October. October 2018 got a fast start as the rainiest month of the year in Costa Rica collecting huge rainfall totals in the first two weeks. Last week’s system organized into hurricane Michael and headed north to land fall in Florida and was replaced by a new tropical low pressure system (shown in orange). The heavy rains and flooding on the Pacific side were caused indirectly by a low pressure system on the Atlantic side in much the same manner as last year’s devastating Tropical Storm Nate. The large tropical low pressure system is pulling warm wet air across Costa Rica and causing heavy rainfall on the Pacific (especially Nicoya) and in the central mountains. 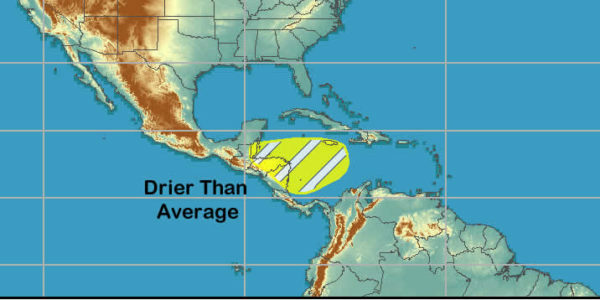 It’s somewhat drier for the lucky travelers who headed to the southern Caribbean which is typically sunnier in September and October. The low pressure system marked in red may intensify in the next few days. 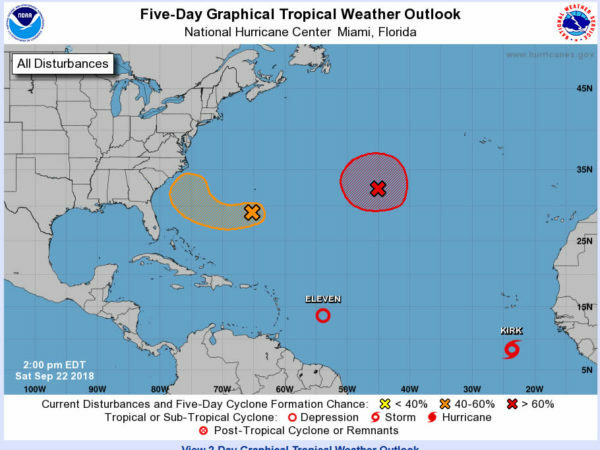 Hurricane Florence and Tropical Storm Isaac faded out at the end of September after causing rain, flight delays/cancellations at U.S. airports but Costa Rica stayed out of the storm path. Well sort of wrong anyway. If what you’re trying to find out is “what will the weather be like next week when I visit,” then a forecast that’s unvarying – saying “chance of rain” for 15 days in a row – is pretty useless and will definitely give the wrong impression. Weather.com and other sites serve weather maps based on current conditions and readings from a few automated weather sensing stations around the country. Unfortunately based on that limited data except in the driest months in the driest regions the forecast is nearly always some rain. 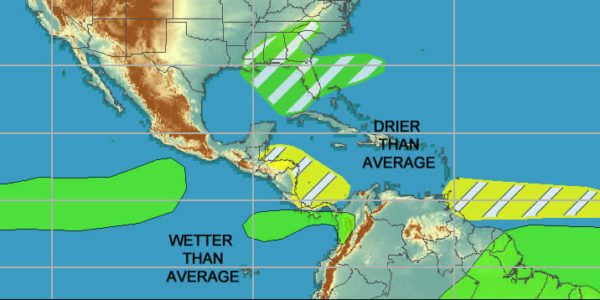 The best “at a glance” prediction comes from the U.S. National Oceanic and Atmospheric Administration (NOAA) weather service Global Tropics Climate Prediction Center which updates a simple wetter/drier, warmer/cooler map every week. The Costa Rican emergency alert system (Comisión Nacional de Prevención de Riesgos y Atención de Emergencias) provides good information for ongoing weather related disasters. There’s no separate listing for current alerts but you can use these date sorted search results (in Spanish) to see them. If you suspect you’re not seeing everything you might try searching “alerta” instead but you’ll need to ignore some old posts about hurricane Matthew that are at the top of the list because they are mistakenly dated “23 Septiembre 2410” instead of 2010. During hurricane season (June 1 through November 30) the U.S. National Weather Service and NOAA (National Oceanic and Atmospheric Administration) do an excellent job of observing, tracking and predicting the paths of low pressure systems, tropical storms and hurricanes as they develop. 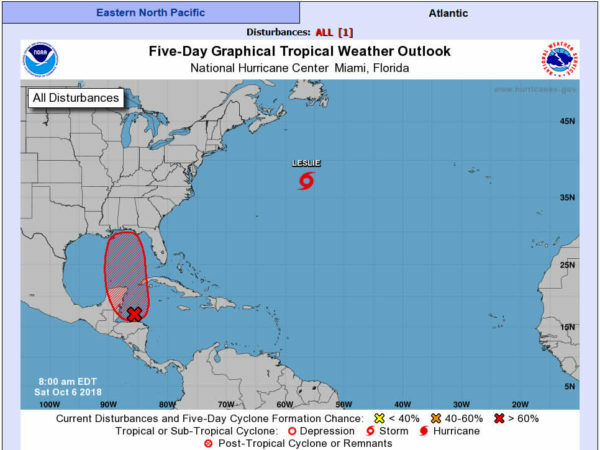 In storm season the “Tropical Weather Outlook” webpage is updated with a new map, probabilities and projected movements every day at 2 am, 8 am, 2 pm, and 8 pm eastern time. This is basically all the information used by weather website, television and newspaper meteorologists. They add a few seconds of video of a reporter leaning into the wind with their jacket whipping and palm trees bending in the background but if you want the very latest information straight form the source this is where to get it. 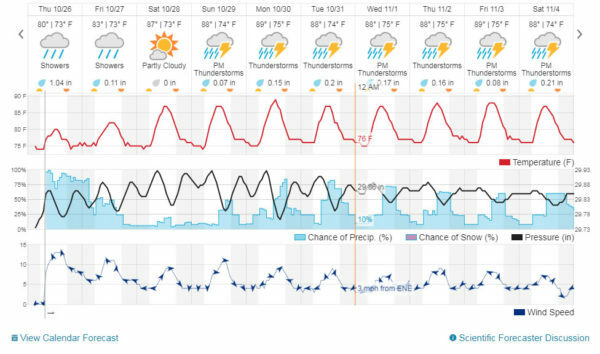 The best simplified weather forecast we’ve found for Costa Rica, and the one to use in the dry season (when the NOAA/NWS hurricane page is not updating because there are no hurricanes from December through May) is the ten day hourly forecast on Weather Underground. 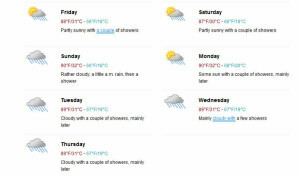 A typical ten day weather forecast for Costa Rica. Note the blue bumps every day in the precipitation chart when the afternoon showers start! We’ve found these reports quite reliable in the U.S. and Europe but they’ve only recently expanded to Costa Rica so we’ve only tested in a few of places a few times. They seem pretty good as long as you’re aware of the limitations. Below are links to regional forecasts. Some locales are listed twice and linked to two different stations because they are in between and checking both reports may be helpful. Costa Rica is a land of micro climates and the weather can vary dramatically in locations just a few miles apart. If you click “change station” on the recommended ten day forecasts above weather underground shows you a map with over a hundred station location options for Costa Rica. If you click on different locations it looks at first glance like there is a detailed report and prediction for each. However, if you look closely you’ll see it’s actually the identical predicted precipitation patterns, temperature profiles and wind speed cloned from the main stations and displayed on each local station. In other words, it looks like there are very detailed micro forecasts but there are not. The local data (current and historical temp, wind etc.) is from an automated station located exactly where the dot is shown on the map but the forecast may not be. I don’t think they are intentionally misleading – this is the best forecast they have for each of the little stations – but don’t be fooled into thinking that they collected and interpreted data then made a forecast specific to the microclimate your lodge is located in. Be aware that if the main station is 20 miles away across the continental divide the upcoming weather could be utterly unrelated to what is displayed! If you want a better idea of what sort of rainfall and sunshine patterns you can expect you’re better off making your own forecast. I’ve always thought this was true and a while back it was confirmed by a couple of friends who own rafting companies. Their livelihoods depend on making a call every day that the rivers won’t be dangerously high from excessive rain. They both arrived independently at the same technique that I use. 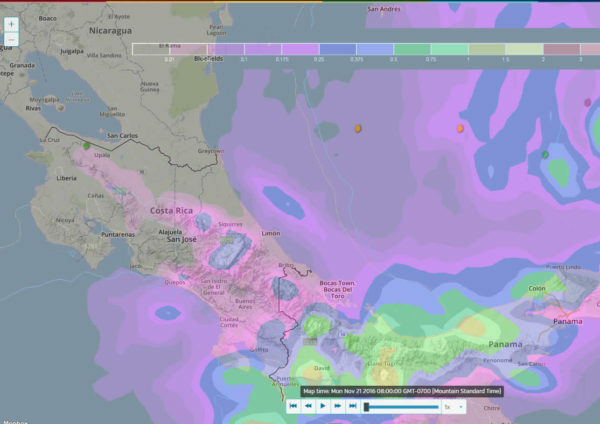 The Weather Underground website has a great live interactive mapping tool – this is an example where we’ve chosen to overlay the IR cloud cover with tropical depression and hurricane tracking for the region around Costa Rica. Okay so every weather forecast is a bit iffy but you can certainly do a better job than the little prediction pop-ups on the weather websites – at least for Costa Rica where they work with very limited information. First you need a general knowledge of Costa Rica’s seasons and weather patterns. That’s available on the handy drop down menu below (just select the month you are traveling for a summary). 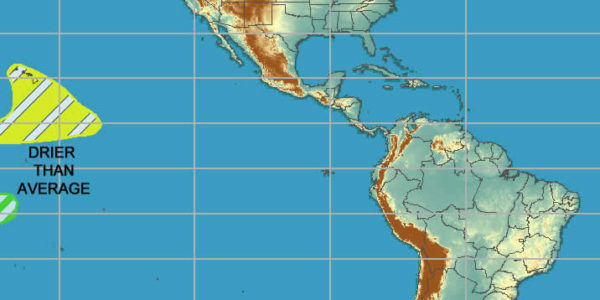 Second you need some information on what is brewing off the Pacific and Caribbean coasts (or has already brewed and is landing). That’s available by clicking on either the tropical storm map that we’ve set criteria for (click image above) or more in depth analysis at NOAA (click image below). Third you combine the two to figure out that since you’re traveling in February and the Guanacaste beach resorts are bone dry then and since the map isn’t showing any huge rainy low pressure systems tracking towards Costa Rica you’re good to go! No need to call Ray and Sue! 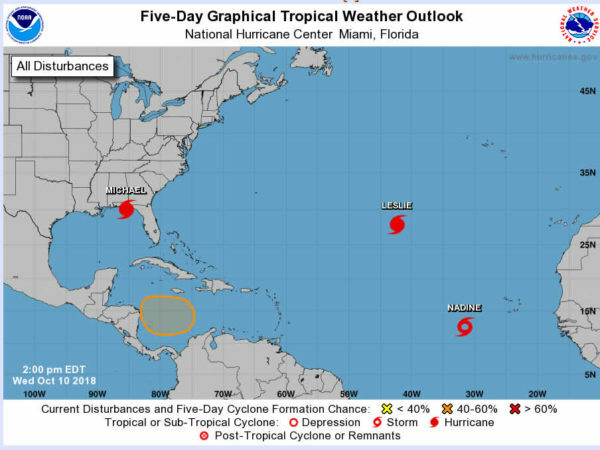 You don’t really care that there’s an 80% chance of it raining somewhere in the country (probably on the southern Caribbean or high in the Talamanca mountains). Of course if there is a huge hurricane bearing down in the Gulf of Mexico or a giant tropical depression trying to collect itself off the Pacific coast you may want to get out your umbrella. NOAA maintains an excellent weather website with info on the latest storms. Many travel websites have what looks like very detailed information for very specific parts of Costa Rica but they’re just putting different labels on the same info to try to make it look specific. There are really only two fully, reliably and continuously functional METAR feed stations in Costa Rica (at SJO and LIR airports) with a dozen others that send very limited data. There’s no big network of ground based Doppler Radar which is where a lot of the specifics in U.S., European and Canadian weather forecast come from. So check out the monthly climate pattern, check out the hurricane and tropical storm map, and then relax! 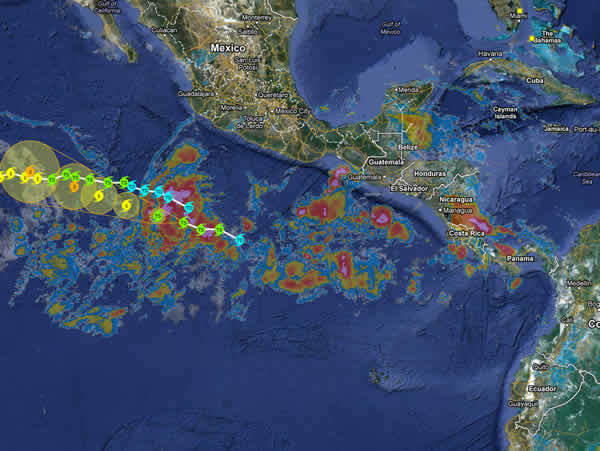 Tropical Storm/Hurricane Nate Note: The eye of the storm was several hundred kilometers to the north of Costa Rica but the airflow patterns created by Nate caused major rainfall and flooding October 5, 2017 (See current road, travel and weather status). 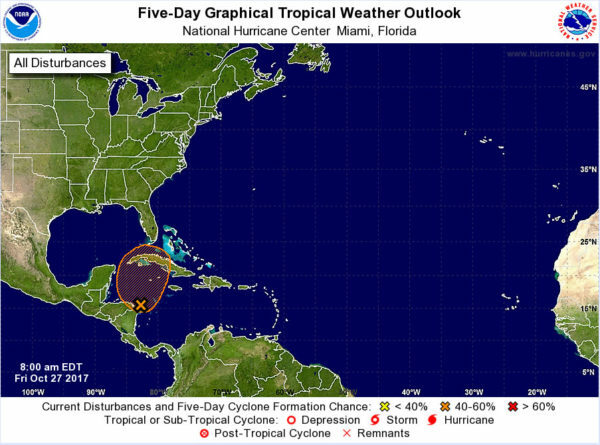 The recent Western Caribbean Disturbance 93L seems to be heading north without organizing into a Tropical Storm or causing significant damage (October 27, 2017). Tropical storm Nate formed in the Caribbean east and north of Costa Rica and never made landfall there but the wind patterns drew warm moist air from the Pacific across the country causing intense rains on the west coast and in the mountains. Tropical storm Otto is moving towards Costa Rica from the Caribbean (see current map). It is predicted to briefly reach Hurricane strength (Category 1 – the weakest Hurricane) around the time it makes landfall later today.